Do you remember seeing this post? If you did – then you might remember that Jack and I had a couple of bags of Key limes in our refrigerator a few weeks ago that were just begging to be used! Today’s recipe for Sweet and Sour Key Lime Pork is just one of several recipes we made using those Key limes! Key limes have a stronger and more tart taste than the limes most often found at the supermarket, so a little bit of their juice goes a long way! Key limes are often used in dessert recipes where a generous amount of sugar can be used to offset the almost-bitter taste. 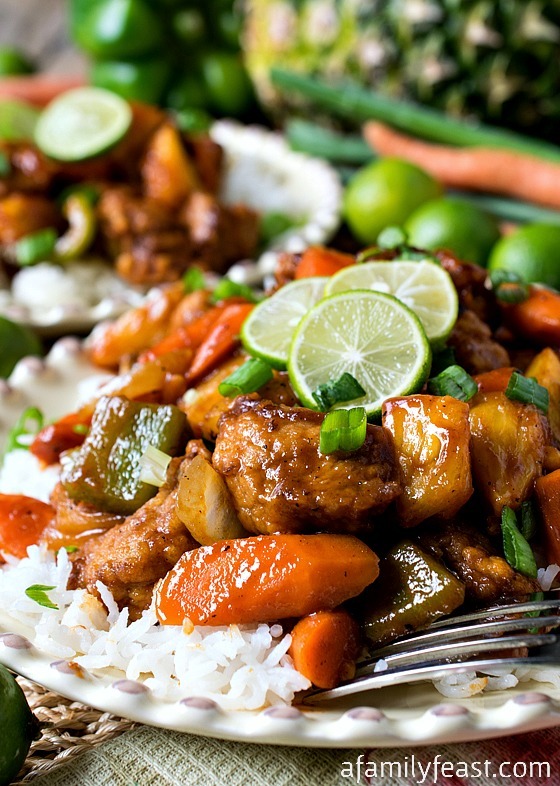 But Key lime juice is also great in savory dishes like this Sweet and Sour Key Lime Pork! We used the juice as a marinade for the pork, and it also adds the ‘sour’ to a sauce that is otherwise fairly sweet thanks to pineapple juice, soy sauce, brown sugar, ketchup and optional red chili paste. 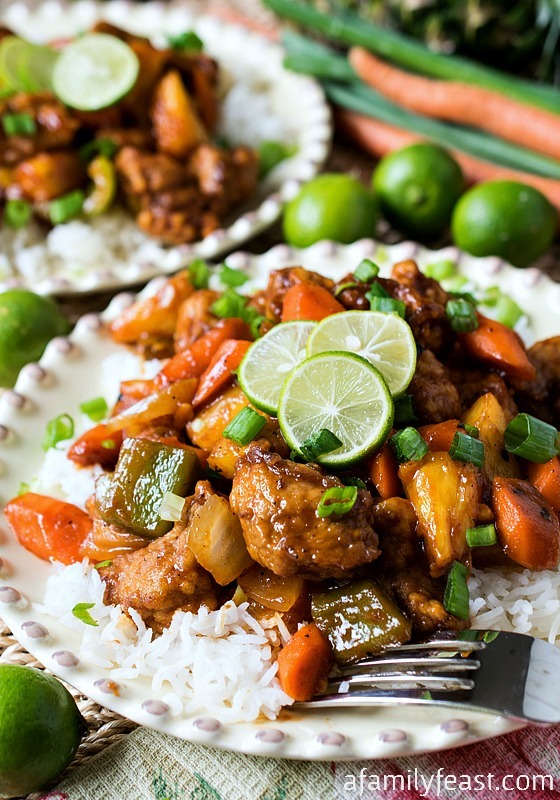 In this recipe tender chunks of lightly-breaded pork tenderloin are sautéed in a wok along with fresh vegetables and pineapple – then that wonderful sweet and sour sauce gets added at the end. 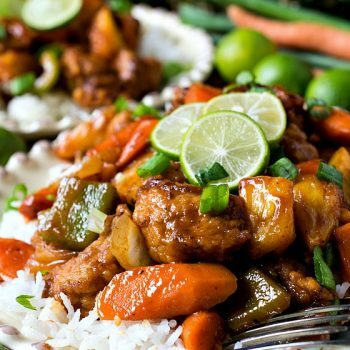 Served over a bed of rice, this sweet and sour key lime pork is a delicious meal that your family is sure to love! And – check back tomorrow because we made an amazing Key Lime Ice Cream that would be a perfect sweet Key lime treat to complete your meal! A few notes: Since the sauce is made separately from the dish and added at the end, you have the opportunity to adjust the taste to your liking. The sauce is (of course) sweet and sour, however if you want it sweeter, add more brown sugar. If you want it less sweet, add more Key Lime juice. Also, the sauce can be made the day ahead if you wish and stored in the refrigerator until needed. Lastly, as with most stir-fry dishes that are cooked using a wok, preparing all of the ingredients in advance is a must so you can cook the stir-fry quickly. Place all sauce ingredients in a medium sauce pan and heat to combine. Remove from heat and store until needed. In a bowl, mix pork, sherry, soy sauce, oyster sauce and key lime juice. Let sit at room temperature for 30 minutes while you prepare the remaining ingredients. Start your rice if you are serving with white rice. After the pork marinates for 30 minutes, add the two egg whites and work into the mixture with your hands. Pour out the corn starch onto a platter or bowl and dredge the pork in the corn starch. Do a few at a time and lay out on a board not touching. 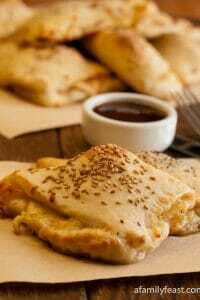 They will be sticky and gooey. Repeat for all pork using more corn starch as needed. Add oil to wok to about two to three inches (deep enough to cover pork as it cooks). Heat to 350 and drop a few pieces of pork in at a time using tongs. Have a plate lined with paper towels close by. As the pork cooks, it will brown and float. As long as you can maintain a steady 350 degrees in the oil, keep adding and removing the pork until you have cooked all of the pork pieces. Set aside. A spider strainer like this one works best to remove the cooked pork from the oil. Drain off oil into a metal container. 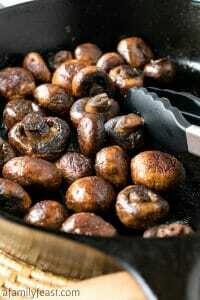 You will be removing five tablespoons of this oil to cook the vegetables and the remaining oil can be saved for other recipes. If you do save it, strain it a few times with cheese cloth after it cools and store in a container with a tight fitting lid (a mason jar works well for this). Clean out the wok, dry and heat to hot. Add two tablespoons of the oil and stir fry garlic and ginger for one minute. Add onions and scallion bottoms and stir fry for about two to three minutes until the onions just start to become a little soft. Add one more tablespoon of oil, add pineapple and stir fry for two minutes. Remove this mixture to a large bowl. Heat Wok back up with remaining two tablespoons of oil and add carrots and stir fry for two minutes then add peppers on top of carrots. Stir fry one more minute and add onion and pineapple mixture back in. Stir fry until vegetables are at your level of doneness then add cooked pork and sauce over vegetables and pineapple. Stir until heated through and remove to the bowl you used for onions and pineapple. 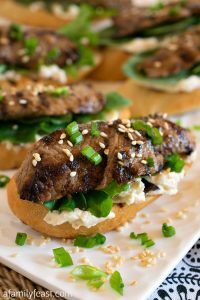 Serve over rice and topped with chopped scallion tops. I love ordering sweet and sour pork when we order Chinese take-out! Great to know I can easily make it at home. Thanks for sharing! I hope you enjoy the recipe Coleen! Love that you used Key Limes in this recipe. Now – don’t get me wrong, I love regular limes but to me, Key Limes are like Meyer Lemons – they just add a bit of a zazazu factor 🙂 Looks amazing! Thanks Aly! 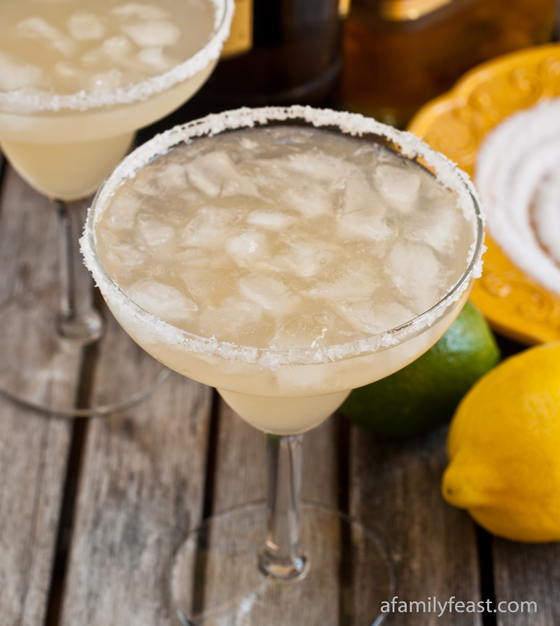 I totally agree – Key limes add so much more than the typical limes! Pork = my “Go To” meat. This sweet and sour key lime pork = my new “Go To” pork dish! Yay! I hope you enjoy the recipe Angela! This pork look amazing! Love the key lime sweet and sour twist. I always end up with extra key limes when I need just a few…will definitely book mark this for next time. Delish! OH my gawsh. I’m going to need a platter of this all to myself. YUM! This looks like my next meal! I can’t wait to try it! Hope you enjoy the recipe Jeni! This is such a great idea! YUM! Key Lime Pork! Oh my. 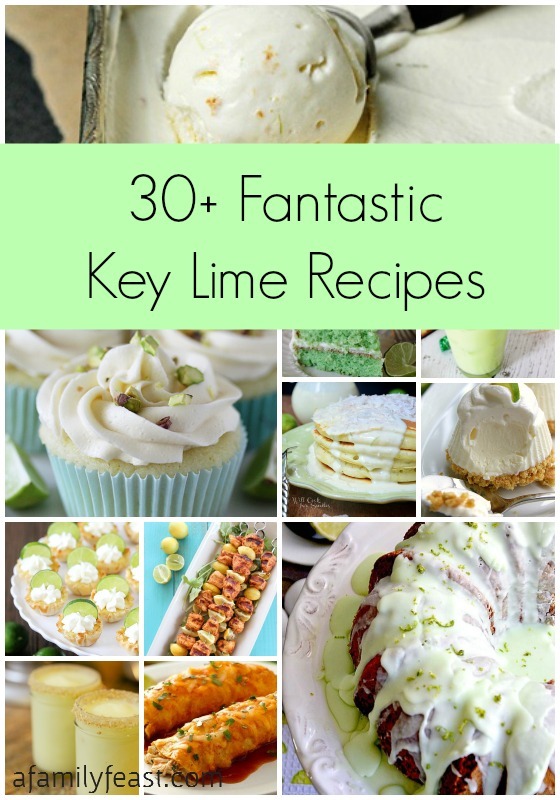 Loving all of these key lime recipes you have here! Thanks for sharing everything! What a special dish. It looks so inviting. Love the key lime and pineapple and all the other goodies sauce!!! I made the veggie version of this for dinner tonight. I used Seitan in lieu of pork. I skipped the egg whites and nixed the oil altogether (we are doing our best to be plant-based). I simmered the seitan in a little water and left-over pineapple juice (adding in small amounts as needed) until it browned the seitan . It turned out very well in my little old pot on the stove. 🙂 My husband will surely love it. Thanks for the great recipe! Sounds like a great vegetarian adaptation Darlene! Thanks so much for sharing! 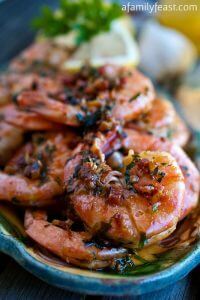 What a great idea for a weeknight dinner! I love pork, especially sweet and sour! Key Lime has always been one of my favorite flavors of all time. Great recipe, Martha! I’m really excited that I’ve seen this before dinner time. Because I MUST HAVE IT! This pork stir fry looks incredible! 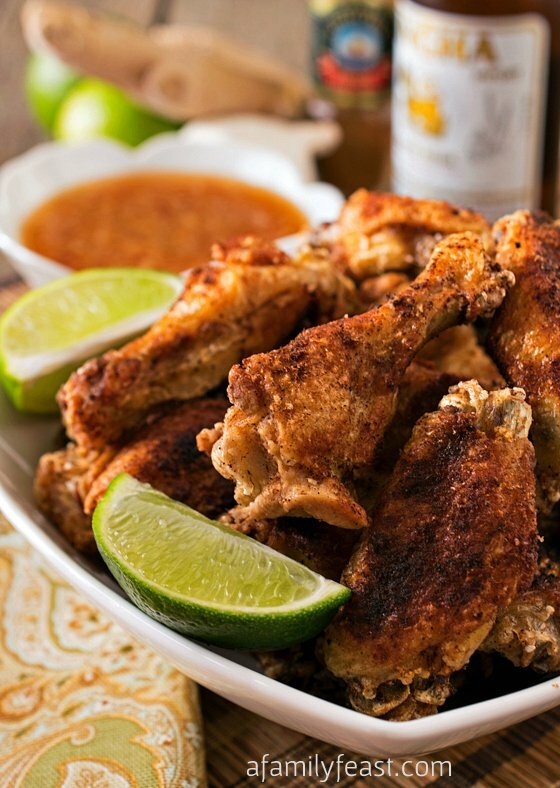 Love the combination of the sweet and sour sauce with lime! My husband would absolutely love this! Pinning! OH MY GOSH!!!! I want to eat this for breakfast!!!! 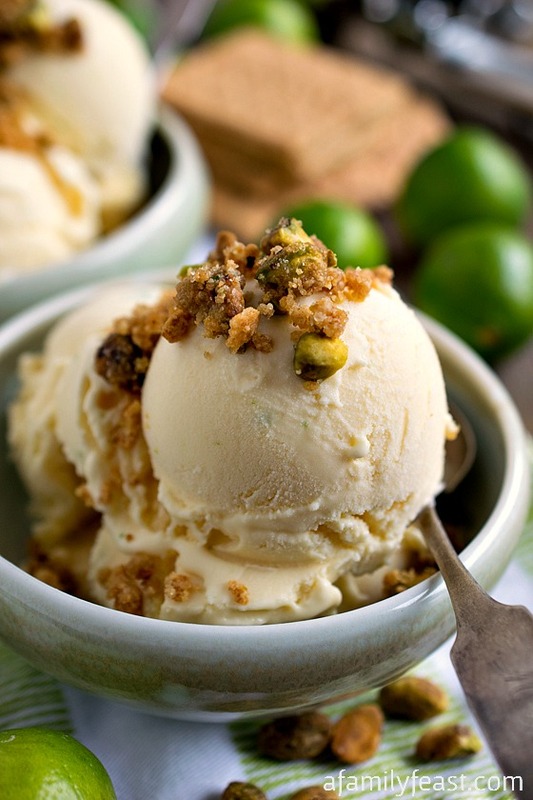 I love Key Lime, this looks great! Wow that pork stir fry looks amazing! I’ve had something similar in a restuarant but didn’t know I’d ever be able to make it. Nice step by step directions, I’m making this!